I was desperate to write something. I read my daily bible reading plan. I prayed for inspiration. I prayed to be motivated. Nothing. Worse case scenario, two little girls came out from their cave; noisy, chattering girls. One with an octopus puppet on her hand, the other with two plush dolphins and a shark. E came over and walked the octopus' tentacles on my head, while F, poked through the rocking chair's holes (where I've seated) her dolphins to my shoulder. 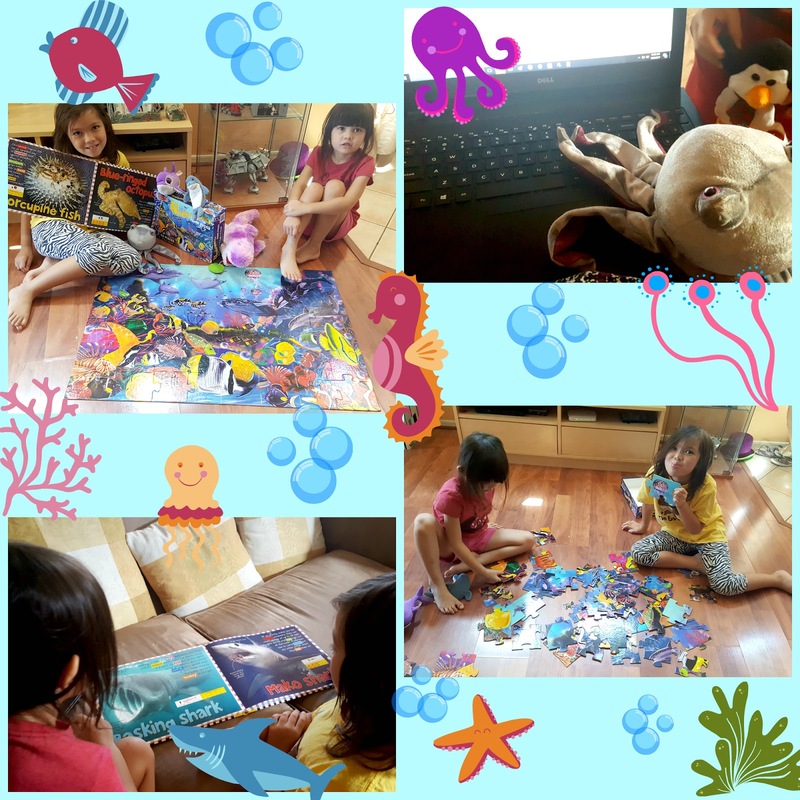 They started talking about under the sea creatures. It was a mess (in my thought). This scene is not what I planned. "I want to be alone right now so I can do what I want to do. How can I write something with this chaos all over me?" I told them to go to their room and give me some time alone. I needed to do something. F went in their room, talking to herself on the top of her lungs. E was two meters away right in front of me petting the cat with her octopus and shushing her little sister. I prayed for peace. Peace inside the house. Meaning, no loud voice because it will drive my concentration crazy. More so, I didn't know what to write which was the major dilemma. I prayed that God will whisper in my girls' heart to keep quiet so Mama can write. That's the kind of peace I asked. I prayed hard. Nope...nothing...nada. The pandemonium worsened. Can you imagine my irritation boiling? Then God whispered to my heart. "You want peace? I will give you peace. Ask your girls to come to you. Play with them." Well, that wasn't my plan at all. But I obeyed. The sound of their laughter and shrieks as I pretended to be eaten by a shark and imprisoned in the octopus' tentacles; the glimmer in their eyes as they shared to me their favorite sea creatures; the bright minds I beheld as they told me what these creatures can do, that's peace. That's the peace my soul needed. As we talked about these awesome creatures, God gave me the privilege to minister to my girls. I saw in their eyes and heard the excitement in their voice, their fascination for these animals. I asked why they like what they like. "Wow, how awesome are these creatures!" I exclaimed. "But do you know who is the most awesome? The One who created them—God!" Even if I didn't tell them it's God, they know. I told them how I marvel at the many creations around me: colorful sunset, beautiful flowers, majestic mountains, fluffy clouds, etc.. These things are just so breathtaking to look at. I told them, in all of these wonderful creations, let us not always forget to look beyond it. Let us always ask the question to remind ourselves, "Who created it?" The Creator is far grander than the creation, so many of us missed to recognize. Then they talked about how the smallest octopus in the world called the "blue-ringed octopus" is the most deadly in all of the octopus family. I made examples of how a small scorpion is more lethal than the big one; how ants, though itty bitty in size, are strong, know how to look for food, and find their way home to store their food. I told the girls how big and small are different in God's ways and the "world". The world considers the big ones as mighty and powerful. Meanwhile, with God, the small ones are mightier and powerful than the big ones. It's funny sometimes how I push myself to do something I badly want to do, and yet, God has a different plan. However, the Holy Spirit does not push me to do what He wants me to do. He is not that kind of God. He waits for me to act on it. He does not fight tooth and nail against my will. He respects my decision of "yes" or "no." Had I not listened when He told me to entertain and play with my girls, I wouldn't find the "real" peace that I needed in that circumstance. Had I not obeyed, I would find myself frustrated with myself and my precious ones. I would find myself defeated for not being able to write something. The "chaotic" situation (which I thought) I was in, was actually the answer that led me to the peace I was looking for. The subject matter my Father planned for me to write is not something from the Scripture I read today. Rather, it is finding my peace in the midst of complete disorder. "The peace I give is a gift the world cannot give." 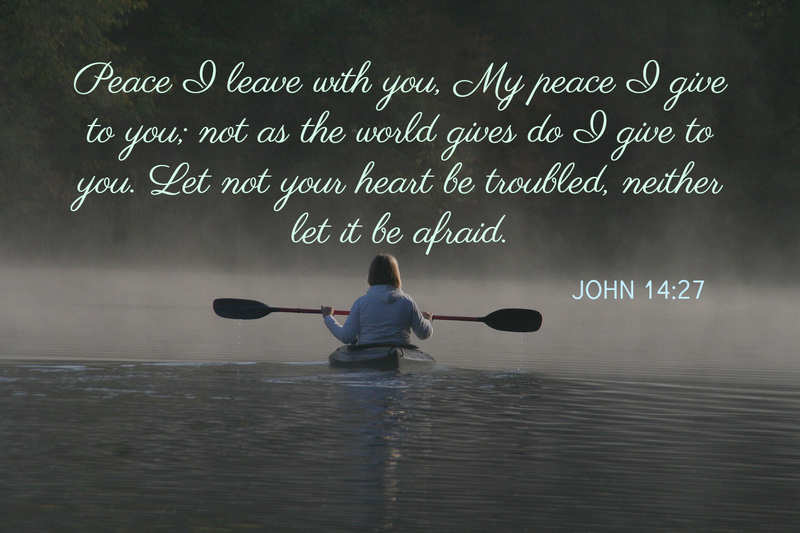 The world may cause my world become chaotic, but Jesus gives me the peace as He promised. My part is to obey so I can receive His peace.